Yes, I know that I just made up a word using another made-up word, and that I am not even using that word correctly…. We have two cabinets in our house with stacks of games. This one is in the front room; the other is tucked away in the living room. 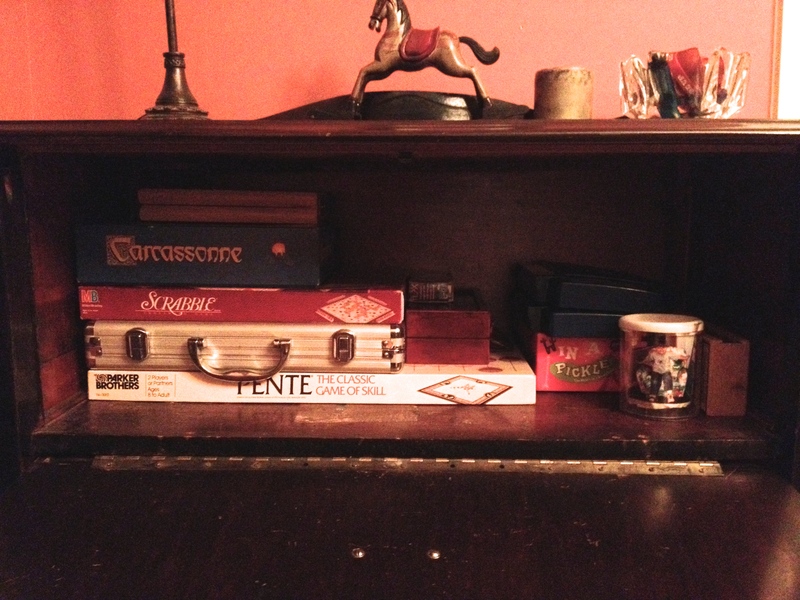 We also have a closet stuffed with games, toys, and craft supplies, but we’re not going to talk about that one today…. There are some games that we still play buried away in these two cabinets, but for the most part, the stuff that is squirreled away in here the kids have long outgrown–the 100 piece puzzles, the phonics games, etc. So the clutter creates a double problem here–not only are we holding onto a bunch of stuff that we don’t need, but it also creates a disincentive to try to dig out any of the board games we might actually want to play. So that was my task today, and boy what a dent I made. I ended up with two stuffed garbage bags of puzzles and board games packed off to give to charity, plus a significant pile of miscellany that had somehow worked its way into the mix. Most of that lot was simply trash or recycling, but there was one true “treasure find”: six disposable cameras, plus a roll of film, just waiting to be developed. The roll of film is labeled “sky diving,” so I know what’s on there, and one of the disposable cameras is a waterproof number, which means it has snorkeling pictures from Key Largo. The other five cameras are complete mysteries. Tomorrow I will drop them off at the drug store to see what they contain. And of course, I promise to shed most of those newly developed pictures, rather than allow them to become more clutter at the bottom of a drawer! As with most of these de-clutter tasks, I am always amazed to discover just how much stuff we have lying around, and just how much of it is entirely superfluous. The more I can cast off at this point, I think, the more likely I will be to appreciate and use what we decide to retain. This entry was posted in Uncategorized and tagged abundance, clutter, family, home, minimalism, simplify, utility. Bookmark the permalink. I know we have a lot of clothes to go through as well…. What did you think of “in a pickle”? Silly and fun. It was right on the line of what I would consider “too young” to hold onto (my kids are 8, 12, and 14). Wow the cupboard is looking good! Well done, you! It must feel so good. Ahh such an amazing feeling! I love space! !